Once upon a time in a land not so far away, lived a happy family, each member trying to become closer to God and each other. Everything was wonderful, in its own imperfect way, until one of the family members became a troll, determined to tear apart the very fabric that held the family so close. Okay, so that’s a bit of embellishment, but this is actually a pretty serious story. One that, until very recently, I couldn’t tell without angry tears flowing from my hazel eyes. This is the story of how someone I used to call Grandma became a very real monster in my own home. How she tried to drive wedges between my family members, pulled my uncles away from their sister, and actually succeeded in tearing down a part of me that I’ve only just regained. Because the story of the monster began long before my time, the beginning of it isn’t mine to tell—it’s my mother’s. That’s another tale of heartache and for the purpose of this post, suffice it to say that my mom’s childhood was not easy. In the summer of 2011, my family (Mom, Dad, Josh, Andrew, and myself) decided it was time to find our forever home. Until this point, we had moved around quite a bit. We lived in various situations (a metal building on a farm, a double-wide trailer home on the same farm, to the city, to a duplex) while I was growing up, so I was really excited to live in a real house for the first time. We didn’t have too many requirements for the neighborhood or the house itself, but we knew it needed three things: 1) Room enough for us kids to come visit with families of our own one day, 2) Space for my mom to teach genealogy classes to anyone who wanted to learn, and 3) A space for Louise, my mom’s mother, to live comfortably with us while she was getting a bit older. The house we found in Little Elm, TX was perfect. It was close enough to work for all working people, had three spacious living areas (one perfect for genealogy classes), and two master suites, nearly 1,000 square-feet each. The set up was perfect. The Church congregation opened their welcoming arms to us, and the neighborhood was sweet and quiet (except for the neighbors across the street who threw parties about twice a month. With full bands). Louise had a great part of this deal. She had her own master suite downstairs where she could spend her time doing whatever she wanted, full access to the kitchen, and the opportunity to join us for family dinner when she wanted to, so she wouldn’t have to cook or eat out (she rarely cooked). She was a free-agent, with every opportunity to spend time with the family, or to be alone like she preferred. My brothers and I were happy to help her with her laundry, or to carry in groceries, or computer issues, or whatever else she needed. She was our grandma and we wanted to make sure she had everything she could need or want. She didn’t even have to help with the mortgage payments, but she wanted to contribute each month, so we let her. Unlike most people who would communicate with their words that they needed something, she lashed out. The first sign of dissonance was the disappearance of our silverware. It started with maybe a fork or a spoon that would go missing for a week or so until we reminded her, but then it became a full on conspiracy. How I wish that was the worst of it. She would tell lies to my siblings about our parents, under the guise of expressing concern. She would try to get us to turn against each other, sometimes succeeding when we weren’t paying attention. When she took me shopping for clothes occasionally (she loves to shop), she’d have me try on clothes in the junior section, then comment on how much I weighed and say we needed to shop in the women’s section. She’d comment on how it’s such a shame that I wasn’t smaller and that I couldn’t fit into the “cuter, more stylish” clothing. Then she’d take us to Sonic and try to convince me to get the largest size fries and drink and to get ice cream. Sometimes, she would try to find out about what boys I liked, but it was always in a creepy and unnerving way. Offers to help her with her laundry and bringing groceries in became demands from her to have us drop everything that we were doing and come “help” her. She would get upset and throw tantrums when we didn’t put her spur of the moment “grocery trips” in front of important family or personal things. It got so bad to the point where my dad had to tell Louise that I wasn’t her “beckon-call-girl.” That made her mad that he said I don’t have to essentially be her slave. One time, I came home from a church activity to find her parked in my spot on the street, instead of her spot on the driveway. It was late, so I parked in the driveway. The next day, she yelled at me for parking in her spot and told me that I was so rude to take it away from her. I explained that she was already home when I got there, but she wouldn’t listen to me. Another time, Louise told my mom (who was bed-ridden and ill at the time) that she wished she had never been born and that she was disowning her. She spread lies about my mom to people at church and even called Elder Abuse on my family. That’s when Louise stopped being “Grandma” to us kids. 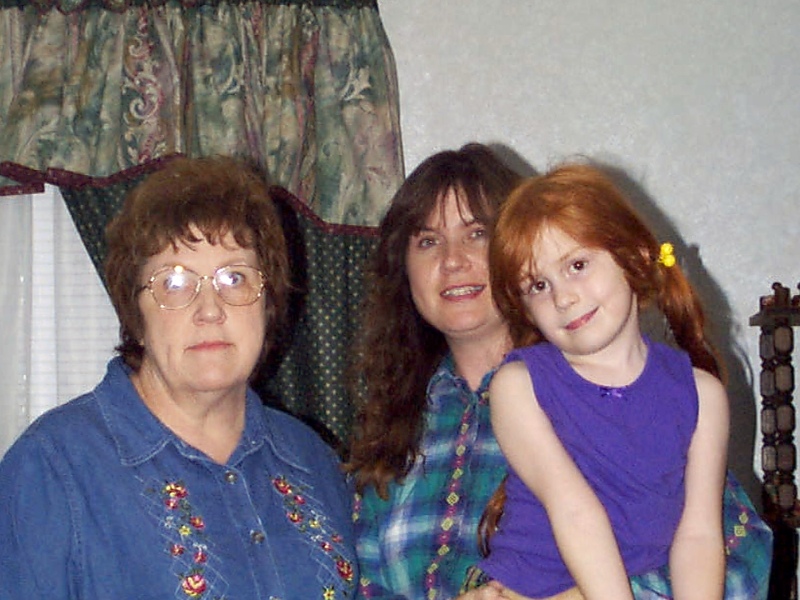 The Spirit of the Lord had left our home, except for in my parents’ room, where we spent most of our time together. My friends were afraid to come over, because Louise would try to spew her hatred of us on them. It was horrible. During this time I had moved to Utah to start college at BYU. It was wonderful to not be in the middle of the crud she was spreading, but the emotional abuse she inflicted on my family was still weighing on me. The worse moment happened in 2014, when I was getting ready to come home for the summer. I still remember the details of that day so clearly that it sometimes makes me feel like I’m reliving it. I was deep cleaning the dorm room I had lived in the past year as an RA and saying goodbye to the best friends I had ever made. I had only gotten about two hours of sleep the night before because of checking out residents, and I was exhausted. I needed a moment of reprieve from cleaning duties, so I called my mom to tell her how things were going and to talk about how excited I was to see her when I got home. That phone call did the exact opposite. My mom was upset and I could hardly understand what was happening. She told me she couldn’t talk and that we were being evicted from our own home. That there were people in our house moving our things to a storage unit because Louise was threatening to have the police come to take it away. Then my mom hung up the phone and I was left alone to finish cleaning and saying goodbye to my friends and coworkers. I remember not being able to breathe and feeling more scared than the time we almost had a tornado rip through our house. My world was crumbling around me and there was nothing I could do to stop it. Worst of all, I still had to finish cleaning my dorm room. Flash-forward a year and quite a few legal battles, we were able to get Louise to leave our house. It took paying her $15,000, but she finally left. In that time, she had turned my mom’s brothers against us and had spread so many lies about us that going to church was unpleasant. Words were exchanged (including one uncle calling me a lesbian), people were blocked on Facebook, and it all ended. To this day, I only allow one family member from that side of the family tree to remain in contact with me. She wasn’t involved and I really doubt she would have appreciated the way we were treated. It was all very ugly. I haven’t seen or spoken to Louise since that day she finally moved out. I don’t care to see her ever again. She hurt my family so deeply that it has taken nearly two years for me to rebuild my self-esteem and torn heart. I hated her more than the boy who stood me up for prom and more than the guy who led me on and then broke my heart. Forgiving them was so much easier compared to forgiving, or even just not hating, Louise. It wasn’t until I wrote out my feelings without holding back in my journal this February that I could even begin to let go. Words that I will never let leave my lips are written numerous times in those angry tear-stained pages. It was the definition of cathartic. Today, I can finally say that I don’t hate Louise. That doesn’t mean I want anything to do with her, but it does mean that my heart is healing. I have let her win by allowing that hatred to fester in my heart, and I’m tired of it. So I’m letting go. I’m telling this story so that I’m no longer holding this inside. Once it’s out in the open, it’s a piece of history. While I’m still dealing with some of the emotional repercussions that are wedged so deeply inside of me (like body-image issues and anxiety), I finally know that things are going to be okay. My family is safe from the monster, and so is my heart. I hope Louise finds what she’s looking for before her time on this earth is gone. I hope she finds a way to be happy—without causing other people misery. I hope that when I pass over to the other side, that I can meet a woman who has embraced the healing and changing power of the atonement of Jesus Christ, so I can embrace her with loving arms. My heart aches for you. I am happy to see you let this go. Happier times are ahead of you.